Writing a novel without some kind of a plan is like building a house on quicksand. It is so much harder to fix structural problems at the end of a draft than it is in the development stage. I don’t agree at all. Structure is a superficial feature of narrative. You can change it whenever you like. What’s truly fundamental is tone. You do need a plan, but the best sequence is–write first, then plan. Then edit with confidence, knowing what you’ve got. Here’s the point about writing advice. I’ve learned to be cautious about dogma, because people are fond of saying what that works for them – their brain, their way of thinking – should be universal advice. Dogma merchants love the mechanics of writing. Some people handwrite their books in elegant notebooks with a fountain pen they bought at Harrods. Others hammer their old computer like a demented Muppet. Which is right? I think it depends how you put words together. Some people painfully assemble their sentences like an old watchmaker. They write slowly – add a comma here? Oooh, tricky! What comes out is serviceable. Bit by bit they build the work. So handwriting is fine. 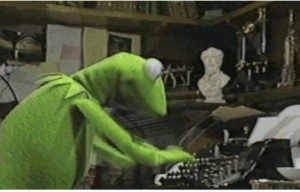 I’m more Kermit thumping out the words on my laptop, to see how the scene works, or whether this approach is too obtuse. I write quick and messy, knowing I will have to go over it again and again. I honestly think I need to write 10,000 words of a major character before I’m clear if they are working. To be forced to handwrite would be unbelievably frustrating. It would be like telling a ‘watchmaking’ writer to write with their feet. I accept the price of this method: writing stuff you change later, deciding an approach is not working, writing stuff you decide to cut. When it comes to a significant review and edit, I change the font and print it out, and mark it up on paper. This is a deliberate attempt to make the work feel like someone else’s. Plot or pants? Plan the work or write by the seat of your pants? See the two esteemed figures above. Brian Aldiss claimed to plan books down to paragraph level before he started writing. Stephen King starts with a situation and sees what happens. I’m more King than Aldiss. However, starting a book without a clear understanding of the final place the characters must end is very dangerous. People don’t forgive poor endings. Where your characters start and end, the challenge they face and the change that happens, is the arc of the book. Starting without this is setting sail in the dark and hoping to find an island which might not be there. I must start knowing an ending, so in one sense I plot. What is the narrative question, asked early in the book, guiding the book throughout, and answered at the end? Should Hamlet kill his wicked uncle? Can Iago destroy Othello by his lies? Will Romeo and Juliet live happy ever after? Stravinsky said, ‘The magic happens at the keyboard.’ Writing deepens understanding of the characters, brings out themes, helps you understand this new idea is a better challenge than the old one. I’m also terrified that a detailed plan will remove the impetus to write the damn thing, just as telling someone a short story idea often stops me writing the story. I start with a rough idea of what will happen, a one side plan. I write a lot, and it makes me reconsider the plan. Sometimes I pause a good way in and redo the plan. But the plan is the servant not the master. Is any of this useful or got any thoughts? Let me know! This article was a suggestion from a newsletter follower, so subscribe and ask!